With the tropical storm Maring (international name Trami) hitting us now, it’s best to stay huddled under soft, warm blankets. But that’s not always an option, so the next best thing is to stay dry and warm with a hot drink. 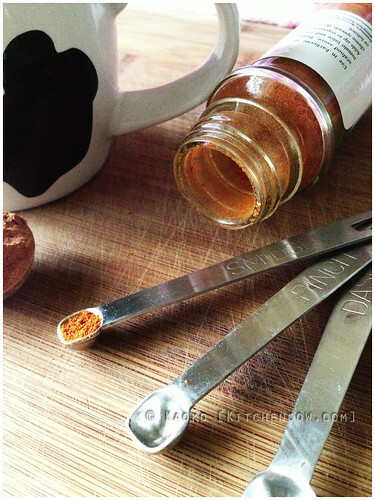 Intensify the heat of your hot chocolate up a notch with the added heat of chili. Chili in your hot chocolate? Why not? The Mayans have been known to add chili to their chocolate. Seeing how they invented hot chocolate in the first place, who are we to argue? It’s easy to knock the idea off, but a well-balanced chili chocolate drink translates to a drink that has a bit of extra spice to extend the heat. It feels slightly warmer than your regular hot chocolate and stays “hot” longer. This is a bit too much, actually. I just thought my smidgen measuring spoon was cute. It’s pretty simple. All it takes is a cup of hot chocolate: use instant, or follow the recipe below for one made from cocoa powder, then add a dash of cayenne pepper. Just the teeniest of dashes goes a long, long way, so even if you have high tolerance for spicy things, start with a dash. If it’s not enough, add more, but start small. If it hurts to drink, you added too much. If it hurts to stop drinking, you’re doing it right. Mix a small amount of milk, cocoa powder, sugar and salt together in a microwave safe mug. Once well blended, add the rest of the milk. Microwave on high for a minute, or a minute and a half. Add a dash of cayenne. Mix well. Taste. Add more if desired. 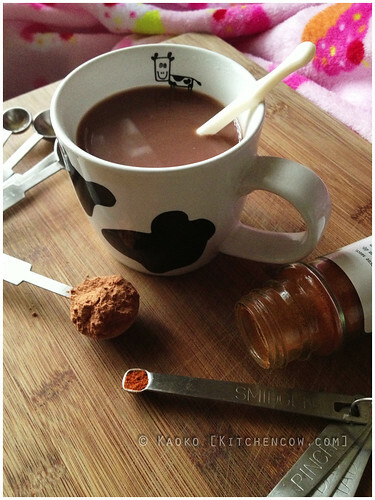 Even though I’m not a fan of spices, I like the idea of chili hot choco. I loved chili chocolate ice cream (only in small doses, though). I’ll try this today. Thanks for the tip! This is just perfect for this weather. Thanks for this! This will be a perfect work companion for this afternoon! It’s perfect. I add 1/4 tsp cinnamon and a pinch of cayenne to my hot chocolate. Now that I do that, I can never go back to plain again. Cinnamon! I shall do that next. Well, when summer’s over at least. 😛 Thanks Rachelle!